Amazon continues to create a voice-first future. In April, Amazon launched Alexa Skill Blueprints, which makes it possible for anyone to create their own Alexa skills and responses, with no coding required. And now Amazon has made Alexa Skill Blueprints shareable through channels such as Facebook, text, Twitter, and messaging apps. The use of Echo smart speakers to manage our smart homes, listen to music (preferably by streaming Amazon Music), and order products and services. 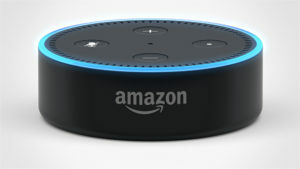 Echo is Alexa’s primary vessel, enjoying a commanding 70 percent marketshare. Voice-based services in the automobile, where Amazon is steadily making inroads both on the OEM and retail sides. Alexa for Business to manage corporate functions such as meetings and conference calls. Involving consumers in the creation of the content itself – our own custom skills (albeit using templates Amazon provides). Giving us the means to share our skills with others via social. For example, in the run-up to Father’s Day, Amazon created a World’s Best Dad template, with which users can create their own list of customized compliments and share them with Dad. Conceivably, brands could develop ways to engage with customers through shareable skills. For example, a hotel could use Alexa Skill Blueprints to create customized content such as personalized messages or tips about new restaurants for loyal guests. Similarly, retailers could create skills that answer customers’ questions about new products lines. Customized skills are also ideal for entertainment brands such as music and film companies to create clever voice-based marketing outreach, such as skills that unlock exclusive Easter eggs. Alexa Skill Blueprints puts the tools to build a voice-based future in the hands of people and, inevitably, brands. Making Alexa skills shareable will accelerate our journey into that future. This entry was posted in Amazon and tagged Alexa, Amazon, Blueprints, David Deal, Echo, Superhype, voice. Bookmark the permalink.